Scott Cohen offers suggestions for improving the traction of concrete pool decks. Pools are intended for fun and recreation, but they can also be hazardous play areas when walking surfaces become wet or the pool is left unsupervised. You'll enjoy your pool and deck more knowing you've made the area as safe as possible. Improve traction. Even a porous concrete surface can be slippery when wet, but decorative concrete treated with a color hardener or sealer can be especially slick because water tends to bead up on the surface. There are several ways to improve the traction of pool deck surfaces without detracting from the decorative appearance. These include the use of textured or exposed aggregate finishes, putting down a textured overlay, or mixing a clear plastic grit into the sealer before it's applied. See Making Concrete Slip Resistant for more information. Install barriers. According to recent statistics from the Consumer Product Safety Commission, an estimated 300 children under age 5 drown in residential swimming pools each year and another 2,000 end up in hospital emergency rooms. The best way to reduce accidental drownings in residential pools is to construct a barrier or fence that prevents children or intruders from gaining unsupervised access. The placement of this barrier should be considered in your deck design and layout. The CPSC handbook Safety Barrier Guidelines for Home Pools recommends that the top of a pool barrier be at least 4 feet above grade and the maximum clearance at the bottom not exceed 4 inches above grade. 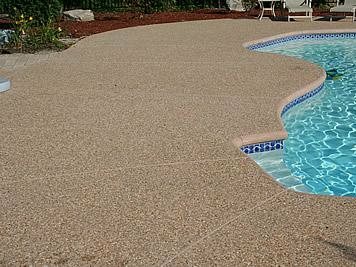 One way to improve traction on a pool deck is to use a textured or exposed aggregate finish. Install alarms or motion sensors that notify you when someone accesses the yard or pool. Install a pool cover, which not only keeps out debris but also functions as a horizontal fence. Check with your local building department to see whether these guidelines or other residential pool safety regulations have been incorporated into your town's building code.